Harlem with its rich culture and fascinating history has always intrigued me. Having never made it on previous New York jaunts we put that right this trip and spent Sunday morning there. We opted for a guided tour figuring this would eliminate the guesswork and let us focus on the highlights – jet-lag was still a factor and with a 4 year old thrown into the mix it seemed like the best option. We pre-booked our tour well in advance, availability did not seem to be an issue though and we still had to go to the tour company office to collect the tickets and then walk several blocks to the coach. Having been up since before the crack of dawn – Son had not quite got the hang of the sleeping thing on the first day – we were actually quite happy to sit in a coach for the rest of the morning and take in the sights. Our tour included all the Harlem landmarks plus a trip to a Sunday morning traditional church service. 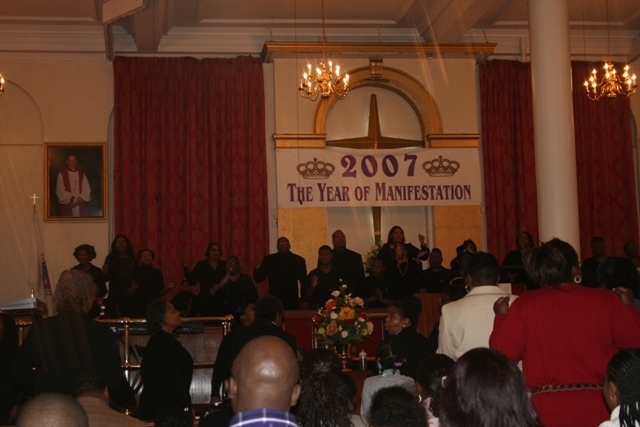 Since the 1990’s visitors (especially Europeans) have been increasingly common at Harlem’s Sunday morning services, home to the ecstatic black gospel tradition that was born during the days of slavery and came north with the African-American migration of the 20th century. I loved Harlem and its landmarks – the beautiful houses of Strivers Row, the Apollo Theater and the Cathedral of St John the Divine were my highlights. We don’t normally go down the guided tour route but on a freezing cold and snowy morning it worked just fine. Our guide was lively, informative and fascinating. The only downside was not being able to explore on our own, we like a bit of pavement pounding wherever we go, no chance for that with this tour. Still, we got to admire the Harlem architecture – stunning and I just adored their Victorian brownstones. Every 5th building seemed to be a church, the crowds lining up to attend Sunday morning services were unbelievable. 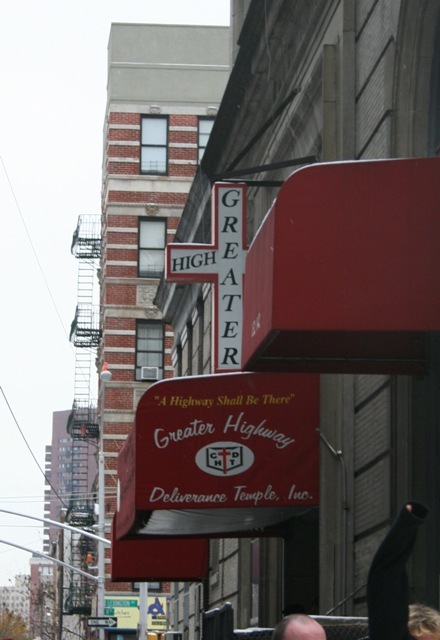 At least 60 churches take part in the gospel sight-seeing trade, we visited a Pentecostal church in Spanish Harlem together with three other bus loads of tourists. The church had special “tourist” greeters at the door, well displayed house rules and the service was well underway when we entered. I felt quite uncomfortable – it felt like we were joining other under-dressed gawkers and a bit like an intruder. There was lots of singing, clapping and lively music. Huge speakers everywhere inside the building meant music blasting at top volume, I found the noise levels extremely uncomfortable and Son spent most of the time under the pew in front with his fingers in his ears. We were ushered out of the church prior to the start of the sermon – apparently they normally last about 2.5 hours – so no complaints on that front. The whole thing was an interesting experience, maybe not quite what I was expecting. 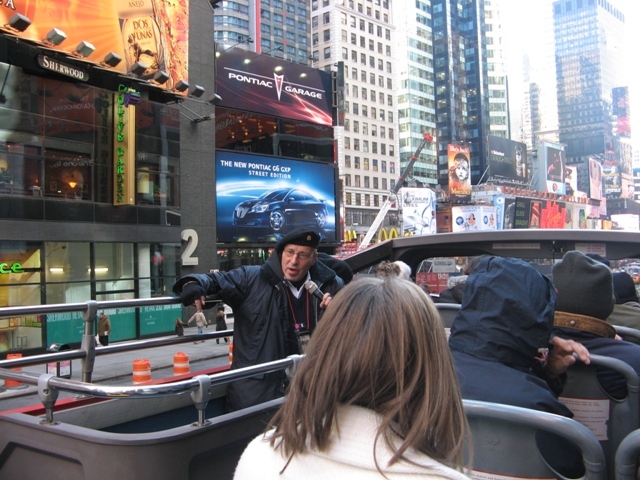 Having done the Harlem tour we were offered cheaper tickets for the Hop On/Off Manhattan tour. Same as with Harlem we figured it would be a good way to get an overview of Manhattan, check out the main sights and then revisit them at our own pace later in the week. 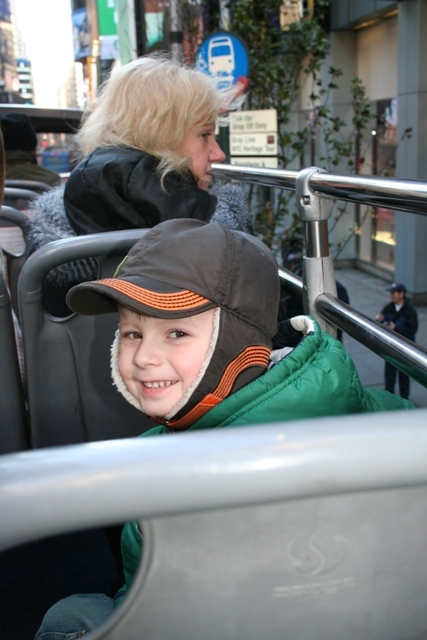 The clincher though was Son’s desire to ride up-top in a open-air double decker bus, for him a must-do. We caught the bus at Times Square and it went as far as Battery Park, passing all the main landmarks and then returning to its departure point. It is definitely a good way to get the lay of the land particularly if you have limited time but it is an activity more suited to warmer temperatures. The guides were constantly warning not to be up-top for longer than 15 minutes due to severe wind chill – a message you couldn’t help but heed. Wonderful views from up-top and a lot of fun, once we retreated to the warmth down below the views and the fun factor were non existant. We hopped on and off a fair bit. The guides were informative and a bit wacky – we enjoyed the commentary but found their constant demands for tips when you hopped off a bit uncomfortable. One guide actually commented through the microphone on whether he thought the tips were acceptable or not – a bit embarrassing for some people and a bit unnecessary. Son enjoyed his brief stint up-top, we figured it would be a good tour to take – just not in December. I can confirm your thoughts. 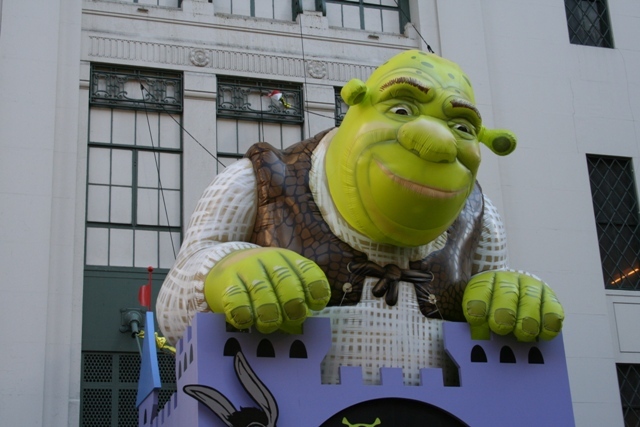 The bus tours are amazing during the summer season. I can also agree with your experience of the guides. Some where pretty funny and gave helpful hints.Others where kind of embarrassing or did not have a lot to tell. 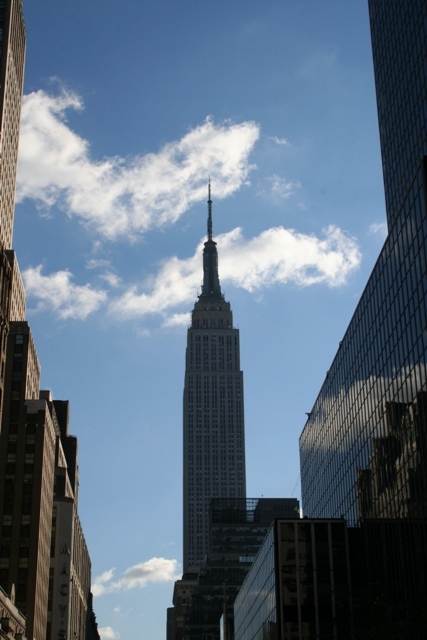 But anyway the view from the top ot the bus and also the possibility to watch the streets of NYC stressless and withouth acking feet is just cool. I just loved the views from the top – from the bottom it was hard to see anything!! I would definitely do a tour again – just pick a warmer time of year!! I know what you mean – that was what appealed to us, something different to visiting an empty church!! It was an experience, definitely different. We ‘ve done the Hop On Hop Off in London and Johannesburg and it’s definitely good for an overview and getting the lay of the land. It’s also great when you are jet lagged and can’t quite put one foot in front of the other. The Harlem tour was very interesting. Did they point out Bill Clinton’s office? No they didn’t point that out unfortunately – I will have to go and find out more about where that was, very intrigued as would have liked to see that!! We’ve become more of a fan of the hop on and hop off tours in recent times and I would like to do this one again, just when the sun was shining and not subzero temperatures!! I think we all might have been a bit fidgety Rosemary – a 2.5 hour sermon is a bit of a marathon. I was concerned before the church part about him being perhaps noisy, as it happens the music was so loud it wouldn’t have mattered. An unusual experience for sure but I’m glad we did it. It was so cold on that bus tour, but if the weather was warmer you could sit up-top all the way and get the most amazing views of Manhattan. Next time…. We loved the views from the top of the bus Pam, it would be nice to try again in warmer temperatures. My husband seems to have an inbuilt GPS and is a great navigator too (unlike me who is 100% useless), we prefer to walk as much as we can too though, I think you get to see more that way! It’s so cool that they offer tours of Harlem, and Sunday morning would be the best time to take one. Thanks for sharing! 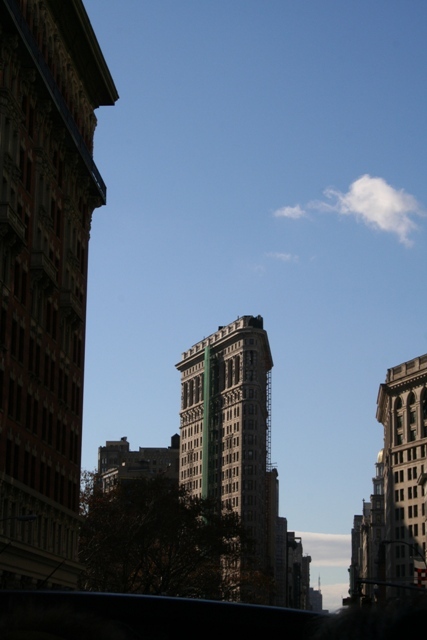 I loved Harlem – the history, architecture and general vibe was great, would love to go back and explore more some day. Apparently it’s very difficult to get to a church service in Harlem without a guided tour. We didn’t get the chance to go there, it’s a little regret I have ! I can imagine it would be tricky to try and sort out without a guide. It is definitely worth doing if you get the chance – not quite what I was expecting, but an experience worth having! I’e been to NYC soooo many times and always plan to visit Harlem but never get that far up! You’ve inspired me. It was something so memorable – definitely recommend it!